ATV World Magazine – North America’s Best ATVing Magazine – The Yamaha YXZ 1000R Unleashed. The Yamaha YXZ 1000R Unleashed. Touted by Yamaha as “The World’s First Pure Sport Side by Side”, the all new YXZ1000R actually lays claim to a handful of SxS firsts. The first full sport, Japanese UTV is also the first UTV to introduce a manual transmission and a Triple Cylinder engine. In the wake of the groundbreaking Rhino and many years of development, the all new, Pure Sport Yamaha YXZ1000R is truly in a class of its own. We’ve all been expecting “it”, but we just never really new what “it” was. The YXZ1000R is going to blow minds and really raise the bar for pure performance and racing SxS’s. 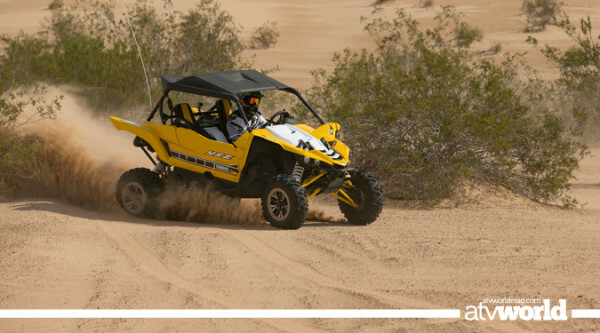 Yamaha had four vehicle attributes they were looking for in the YXZ; durability/reliability, suspension/comfort, engine performance, and to be able to cover challenging terrain at speed. The new triple cylinder YXZ1000R engine is built for excitement, with a previously unheard of 10,500 RPM redline, and the highest HP of any naturally aspirated UTV engine. The high revving triple was also designed for smooth power delivery, high torque, and Yamaha durability. The YXZ triple is comprised of ceramic coated, cast aluminum cylinders, with 80mm forged pistons and connecting rods. It also features a single axis counterbalance and an Anti-Vibration bolt in the head. The Dry sump design maintains oil flow at any angle, so the engine can be mounted low in the chassis for superior weight balance. The high-tech engine is fed by triple 41mm throttle bodies, and it gets plenty of clean air from a dual element air box set up. The YXZ is the first UTV to ever come with a manual transmission, but not just any old transmission. Yamaha gave the YXZ a Sequential Shift 5-Speed Manual, w/Reverse. Yamaha opted for the 5-Speed manual over the typical CVT for multiple reasons. First and foremost is the overall exciting driving experience of being connected to every shift, and the manual is also more efficient and durable with the higher HP. The transmission/clutch is completely separate from the motor, but actually very similar to a motorcycle or ATV with a basket, 11 friction plates and 10 steels. Looking for what Yamaha calls Pure Sport Terrain-ability, they started by giving it 13” of ground clearance, even with the slightly smaller than industry standard, 27” Maxxis 2.0 tires. The radial tires provide precise steering and maximize traction. The drive system gets Yamaha’s On-Command 4wd system with simple knobs that access 2wd, 4wd and Diff Lock. The front Diff features a Torque Limiter, which is basically an internal clutch pack to protect components from High Spike Loads. Industry standard 4 wheel hydraulic disc brakes will stop it in a hurry. The Pure Sport Suspension is designed for comfort, bottoming resistance and confidence at speed. The suspension system is designed for minimal camber change throughout the stroke, and controlled bump steer with EPS to soak up any possible negative feedback. The 16/17 inches of wheel travel is controlled by “real deal”, fully adjustable, FOX 2.5” Podium RC2 shocks. The RC2’s feature bottom out cups with position sensitive compression damping that prevents harsh bottoming. Yamaha’s trick suspension design also uses a progressive leverage ratio and Anti-Sway Bars for “flat” handling. The rear suspension system uses a rearward stroke to absorb impact and promote straight line tracking, similar to the way that sport ATV front ends feature a slight kick up. The interior looks to be as refined as the rest of the package. The dash features a super cool digital meter with a Tach and a true working shift light. Floor boards have both driver and passenger foot rests built in, and the full back seats include plenty of bolstering to keep you comfortably in place. The front end features four LED headlights and a steeply sloped front body for top notch visibility. THE BIG QUESTION – WHATS IT LIKE TO DRIVE? Yamaha invited us to come experience the YXZ for the first time in the massive sand dunes of Glamis. The release was in early late September, so with the exception of expecting extreme heat, we were all very excited at our first chance to drive the machine we’d been waiting so long for. Arriving into a campsite full of about twenty long travel; rip-ready; high horsepower; manual transmission; Japanese quality sport Side by Sides was a treat in itself. All the machines that were waiting for us were Special Edition models with the 60th Anniversary Graphic and true beadlock wheels; there wasn’t a person in camp that wasn’t excited for this. Shifting is lot like a high-end race car, with a floor mounted clutch pedal and a dash mounted shifter. The sequential pattern is very fun when you’re driving, but it takes a little getting used to. When you need to drop a few gears in a hurry for an immediate terrain change or transition, you’ll find that you have to quickly go through each individual gear to get back to first or second, for the base of a steep dune transition or other obstacle. As you quickly figure out the shifting, you will realize how fast the screaming motor really is. It begs to be hammered on, red-lining at 10,500 RPM, and not even looking for a shift before 9K. The motor feels fast, even when short shifting, because you don’t realize that you’re leaving an extra 2,500 or so RPM on the plate. When you realize that it can be revved to 10 grand, it gets even better. After a morning in the dunes, we determined that around 8,000 RPM is really the sweet spot, as long as you get past it once in a while. The suspension is on point as well. Stock specs are really good, and you can quickly tailor the fully adjustable RC2s to your liking. Overall, it feels lower and more stable than most any other UTV yet. It stays flat in the corners and is really confidence inspiring when laying it into a corner, harder than you would on any other stock machine. Jumping is predictable and really fun as well, but we did find the bumper/skid to dig in a few times on nose heavy landings. At the end of the day, the YXZ proved to be a great machine. With a whole day of dune riding in extreme heat, there wasn’t one mechanical problem. This is honestly what we expected from Yamaha, and why we couldn’t wait to see what they were bringing to the table. The manual transmission proved to be a blast to drive; it’s super hands-on and really intuitive. After a whole day in the dunes, I will also have to say that constant shifting does take a little bit of a toll on you. While we couldn’t wait for manual shifting, the more traditional CVTs do make pretty good use of the available power brainlessly. Being a racer, I wanted the hands on, constant shifting, but I think that a little more relaxed owner might want to try it out and make sure that it’s not overwhelming. The motor makes incredible power in the mid to top, but you have to remember that it’s ripping between 6,000-10,500 RPM, and if a steep dune transition requires you to drop below that, you’re gonna have to be shifting to stay in the meat. The only other slightly negative thing we noticed was a vibration at under 5K, and quite a bit of heat on the floorboards. With that said, it was pushing 90 degrees in the middle of the day, and we have yet to drove this beast on the hardpack dirt. Overall, we are pretty pumped that it’s here! It’s an amazing machine with a unique driver connected drive to it. Yamaha’s fit and finish, attention to detail, and down right durability should quickly put all the other manufactures on their A-game to stay competitive. The digital guage features an oversized tach with shift light. Suggested retail price…$24,349 or $26,149 for S.E.